What a great house right on the River! I took my girlfriend and some friends here for a weekend surprise Bday celebration, and we had such a great time. You are literally a two minute walk away from a floating company, so its easy to have fun on the river. 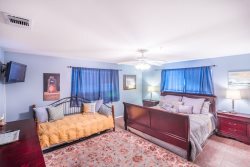 The house is extremely clean and spacious, and we had no problem comfortably enjoying the space with 6 adults. I highly recommend this spot to anyone looking for a relaxed river retreat. I have been working with NB Leasing and Resorts since purchasing my Waterwheel Condo. Their staff has always been pleasant, professional, and easy to work with and very welcoming when I visit the office . They take exceptionally good care of my property and keep me informed of anything going at my condo. I have been with NB Leasing for about 7+ years and I wouldnt change a thing about how you do service, NB Leasing and their staff are amazing people and always keep me informed with what is going on with my rental property. I will continue to do business with them as long as they are available. You guys are GREAT!!!! As owner of the venerable nationally, state and county landmark - Schmitz Hotel, I deeply appreciate that NB Leasing has accorded exceptional care of this treasure and the people who choose to share in the experience by being our guests at this historic hotel. Upon our arrival to New Braunfels our plans hit a couple of bumps in the road but contacting New Braunfels vacation rentals was the answer. The staff went above and beyond to find us a beautiful spot at the very best price available. Much thanks to Karina and Julie! We lived in the Jefferson Davis suite from June through mid December of 2015. First, location, location, location. You can walk to everywhere from this hotel, including the Schlitterbahn, numerous great restaurants, Nagelins for amazing pastries and Landa Park to name a few. We had a porch that overlooked the town square, so we could sit out and watch the many festivities there. Our suite was well stocked to allow us to cook, and there is a laundry in the building if you need to take care of that. The suite was spacious and clean. Curt, Karina and Julie at New Braunfels leasing are great. If we needed anything all we had to do was call or pop downstairs. ( They are located on site!) While we now live in New Braunfels, we plan to return to the Schmitz for an "at home" getaway". We highly recommend a stay at the Schmitz! AWESOME WEEKEND!!! We celebrated my birthday this weekend and stayed at the C211 condo at Camp Warnecke. We LOVED it! We walked out the door and had instant access to the Comal river where we spent most of our days floating. The view of the river was amazing from the downstairs patio and the upstairs balcony. We enjoyed the piano bar immensely which is just minutes from this condo. Of course, my favorite feature of the condo was the wine cooler. It kept our celebratory wine perfectly chilled! :-) I would highly recommend this place to anyone that is looking for a fun get away. We are Winter Texans and have been renting a condo from NB Leasing & Resorts for 6 winters. We enjoy working with them. We are always greeted like family when we visit their office in downtown New Braunfels. Curt and Denise have done a fine job of selecting the people who work with them. Everyone is friendly, helpful and knowledgeable. From time to time, we have had issues come up that we brought to the attention to NB Leasing. We continue to be very pleased that each of these incidents were given full and immediate attention and were resolved quickly without further prodding from us. We have learned that when an issue is presented to NB Leasing, it will be dealt with and resolved quickly. They are very good at communicating. We were constantly apprised of the status as resolution was reached. We look forward to next year when we will again, rent a condo from NB Leasing. About a year ago, my husband and I contacted NB Leasing & Resorts, about putting our condo in the rental pool. Curt and the staff at NB Leasing & Resorts have always been professional, and good to work with. They do a great job of keeping me informed about the status of the property. We plan to continue doing business with them. New Braunfels Leasing and Resorts is a top notch management company to work with. They put their customers number one. Special requests do not faze them. The entire staff will respond in everyway to meet your request. This was our third five months winter stay working with them at the Schmitz Hotel in the Sam Houston suite. The Schmitz Hotel is a super property because it is located on the Main Plaza in downtown within easy walking distance of nineteen restaurants from four star to fast food restaurants. Whatever your pleasure, Mexican, German, BBQ , chili, burgers, steaks to pasta. Great for families because the Schlitterbahn and Comal River are just blocks away for your tubing or kayaking fun. A big plus is off street private parking right behind the hotel. I would like to briefly take some time to thank New Braunfels Vacations and Resorts for an amazing stay. Sarah, who assisted me with booking, was very courteous and attentive to my groups needs; in addition to everyone else whom I interacted with prior to and during my stay. The condo (H103) was absolutely GORGEOUS and fit my groups size of 7 perfectly. The attention to detail from the fully furnished unit (which included dishes and cookware) all the way down to the welcome packet waiting for us in the condo with information of local activities, phone numbers, etc. was spot on. We thoroughly enjoyed ourselves and will DEFINITELY recommend and utilize NB Vacations and Resorts next year. Thank you for an incredible weekend getaway. We have been with NB leasing for a year. We are so happy with all the friendly service compared to our previous leasing agents. NB leasing is the BEST! I cannot tell you how pleased I was with the condo. Everything was so nice. The condo was such a nice size for our group. We plan on returning next year for sure. Thanks for everything. This condo was perfect for our group. We especially loved having the pools & hot tubs for the kids to enjoy. We even used the charcoal pits to bar b q Saturday night, thanks!